As much as we would like to believe that our teeth will last forever, that is not always the case. Multiple factors can lead to one or more teeth going missing in a lifetime. Although it’s unfortunate to lose a tooth, there are also plenty of procedures available that can restore your smile. Dental implants are one of the more effective treatment options for patients looking to replace teeth that they have lost. 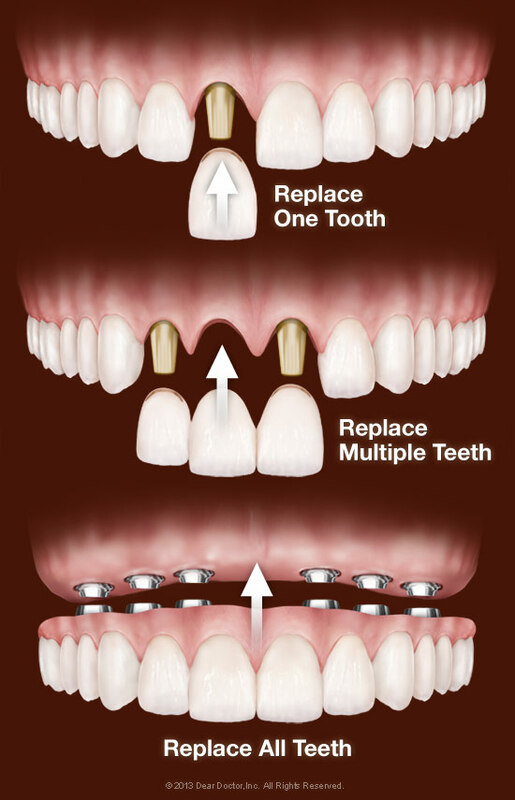 Dental implants consist of a titanium rod that is surgically placed into the jawbone. In order to receive dental implants, there are a few requirements that you must meet. Most importantly, your jawbone must be able to accommodate the addition of an implant. Due to the fact that the bone begins to weaken at the onset of a lost tooth, it’s not unnatural for the jaw to atrophy over time. Without enough strength in the jawbone, implants will be unsuccessful. To accommodate your need for implants, Dr. Cohenour may suggest a bone grafting procedure, which rebuilds the jawbone so that it is strong enough to host implants. Finding out whether dental implants are right for you is a matter of discussing your treatment goals with Dr. Cohenour. You can identify the issues you have with your teeth while learning more about what dental implants entail. Fortunately, there are several versions of dental implants that are bound to suit the parameters of your smile. Dr. Cohenour offers all-on-four hybrid implants and fixed dentures that help you achieve a happy and healthy smile. When you come in for a dental implant consultation, Dr. Cohenour will perform a general examination to identify any underlying concerns that could impact the success of your implant surgery. Based on his findings, he will recommend the dental implant treatment plan that is best for your unique needs. This is determined by the talk Dr. Cohenour has with you, wherein our dentist sets expectations and explains how the treatment works. All dental implant procedures are performed using sedation techniques that relax you during your treatment. Dr. Cohenour also makes use of dental lasers for added precision while he completes your procedure. If you would like more information about dental implants, or to find out whether they are right for you, contact our office and schedule an appointment! SmileArts Dental Studio provides dental implants in Yukon and to all surrounding communities. We’ll help you rebuild your smile from roots to crowns.